“Wasp” first appeared here in October 2015. This entry was posted in Perception, Poetry and tagged creative writing, death, life, mindfulness, nature, perception, philosophy, poems, poetry, writing by robert okaji. Bookmark the permalink. How wonderful to weave beauty around this threatening little creature. They fascinate me. Most of our local nest builders are docile, or at least not aggressive. But occasionally the others appear, and I’ll have to remove their nests. I don’t like disturbing insects, but the aggressive wasps don’t seem to give you much option. They hide their nests and then attack you because you don’t know they’re there. Not fair! The ones that insist upon nesting on my front porch annoy me. I’ll let them alone if they ignore me, but after a few aggressive moves on their part, I’ll act. I’ve lost count of how many times I’ve been stung over the years. Me too!! Our insect guy says they’re dumb. Worst combination, isn’t it–aggressive and dumb? I knew you’d get my point. As annoying as these creatures are, I can’t help but think of the plight of refugees. Yes, they seem to be unwanted no matter their intentions, no matter where they go. Hate wasps, love your poem. Thank you, Don. I admire wasps, but don’t think I’ll be cuddling with them anytime soon. You are always so kind, Candice. Thank you. Truth my friend in times of challenge always truth. There’s that motif again of the birth/life made possible only through brokenness/death. There must be something to it, for season after season, it builds its nest in my heart, and just at the moment I believe I can’t bear another winter, the black sheath cracks, falls away, and reveals a new way to hope. My greatest phobia. Beautiful poem, nonetheless. Thank you, Kat. They are interesting creatures, but can be annoying. The English summer is plagued by these devils whose use i do not understand. to be eaten means they serve a function at least, i should know that really, i just hate the things. if only people would give up sweet things they may not be such a bother. i wouldn’t mind watching a spar off between an ant & a tarantuala. i watched a goshawk slaughter a pigeon & haul it up off the road, or try, a hire car scared it off. I’ve never seen the duel in person, but have seen videos. I have, on more than one occasion watched wasps dragging tarantulas across the ground. Impressive. So beautiful! I felt myself entering into the experience of birth and death of the wasp, extending also to ourselves even. Thank you. The cycle extends to us all. wasps are fascinating and terrifying at the same time. 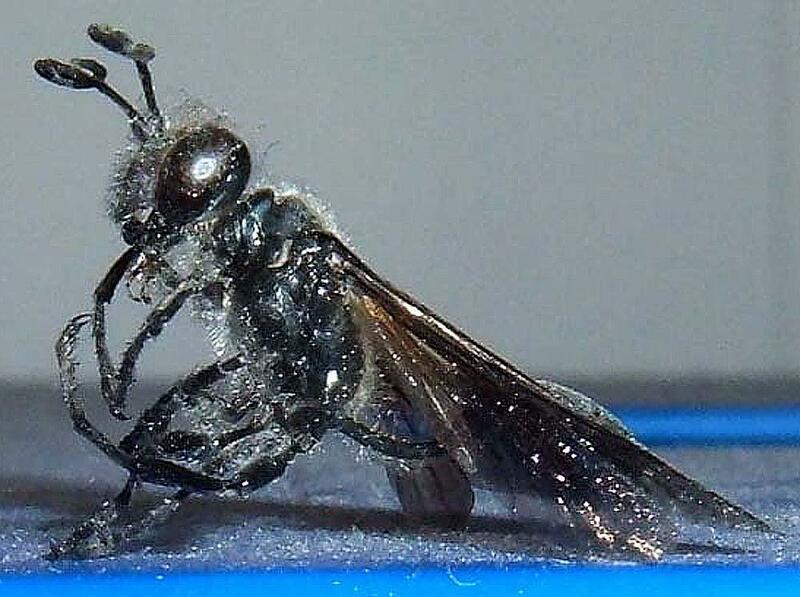 I love the way you dodged us around our preconceptions of wasps and showed us another way to perceive them. They are indeed. I respect them as I do scorpions – if they leave me alone, I leave them alone. I love the last line. It says it all. Thank you, Barbara. It seems they are entwined. Just this morning on my walk I saw a swarming of what I am assuming were wasps – although their coats were so shiny and blue. Maybe native to Australia. All the walkers were zigzagging around them. What power in such a little body. I really appreciate how you’ve found the gift of life in them. Blue wasps! How interesting. Wish I could have seen them. I’m tempted to go back and find them and share a pick … but they were wasps … and it’s approaching 35 degrees celsius … and maybe when I take a photo they’ll turn out to be something much more benign and nowhere near as inspiration. Tee Hee. Ours are generally black, brown or rusty red. Blue is truly inspiring! I loved your musings. Thanks for sharing! Loved the poem. Will read more of yours in the future. we die a thousand times when sleep, but by sleep every human organ is always healing no matter how deep is the wound. Hmm. That makes us sound like the Borg. They have hurt me, and I seek vengeance upon the heap of them.